Please download/print your complimentary PATA Gold award-winning article 'Safe, Not Sorry!'. What makes a great GM? Do you have what it takes to reach the top of the hospitality ladder? 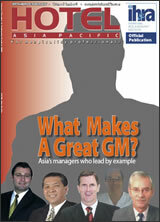 We ask six industry leaders in Asia how they got where they are today - and identify key characteristics essential for making it to the GM's desk. A small property with a big attitude claims it has the most high-tech features of any hotel in the region. Global distribution systems set to break 100m room-night barrier. The challenge of recruiting and retaining the right calibre of staff to meet the new hotels springing up throughout Asia. A recent decision by a Hong Kong court acts as a cautionary tale for the unwary hotelier doing business in more than one country. Despite their success elsewhere, the region might not be ready for these investment vehicles. Mark Shuda, senior F&B director for Wyndham Worldwide, has put together a global wine programme designed to surprise and excite. Please send your comments and suggestions to our webmaster. © 2005 Hotel Asia Pacific. All rights reserved.